Even considering the almost obscure location of Sodam Korean restaurant near Lori’s Natural Foods, Young’s Korean is even more out of the way over on Mushroom Blvd basically behind the Christmas Tree Shops in a non-descript office park. Unless you are looking for it, there is basically no way you would run across it and that’s a shame since it is one of only three Korean restaurants in Rochester. For whatever reason, I haven’t had a chance to try them out until this past Friday when we sat down for an early dinner after a long week of work. Young’s doesn’t offer a ton in terms of atmosphere mostly consisting of white lighting and drop ceilings with fake plants, carpets and tile. Certainly not modern, but not uncomfortable especially with the welcoming servers we dealt with. We ordered the beef dolsot bibimbap and the nakji bokum to split between us and luckily the food came out relatively quickly since we were famished. 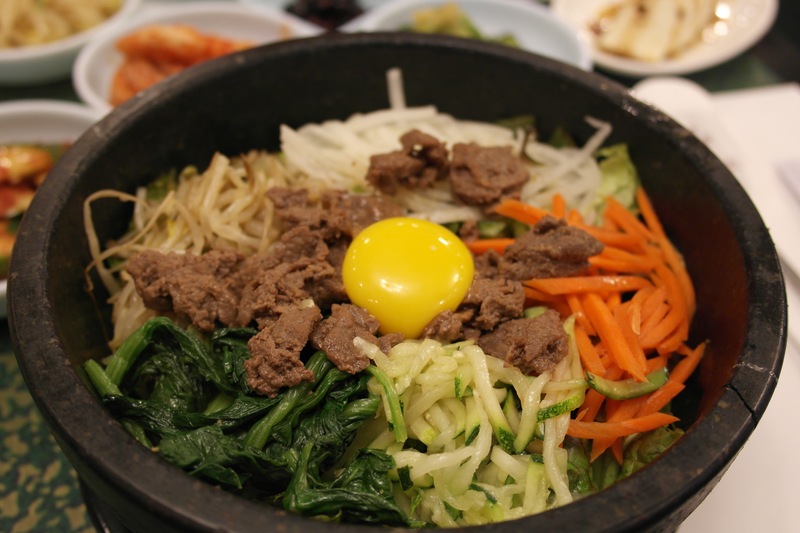 For those that aren’t familar with Korean food, bibimbap means “mixed rice” in Korean (thanks Wikipedia!) and comes out at Young’s with sliced vegetables (carrots, greens, zucchini, sprouts, radish and lettuce), white rice, beef and an perfect unbroken egg yolk on top. The dolsot part is a hot stone pot that the ingredients are served in to cook everything together and hopefully give the rice a bit of crunch. This pot didn’t achieve that amount of heat but definitely kept everything hot. Since their version came out essentially unseasoned we utilized the banchan (side dishes) and hot sauce that I think had a gojuchang (Korean fermented chili paste) base and plenty of sweetness. 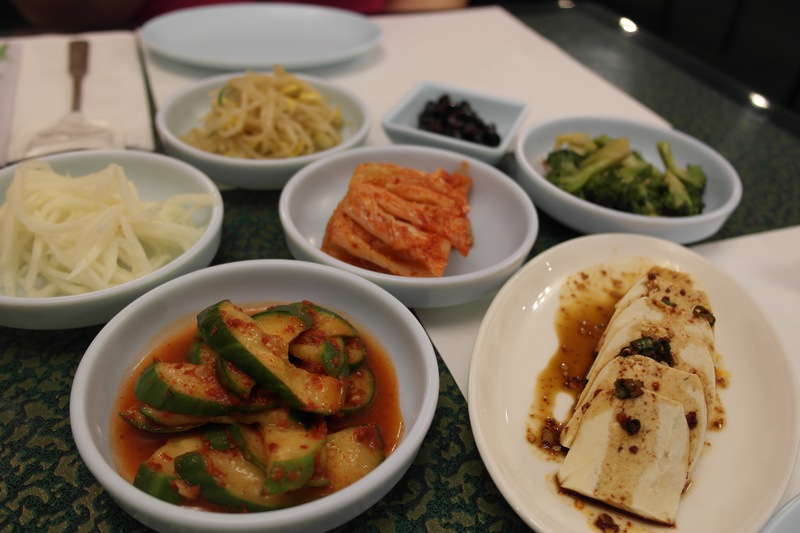 The banchan consisted of a number of pickled items (broccoli, cucumber, radish, sprouts), kimchi (fermented cabbage and chilis), black beans and tofu and added needed acidity and salt to the dish when mixed in. The kinchi had a good amount of fermented flavor and a good amount of salt and spiciness. My personal favorite group of banchan in Rochester. I would prefer some base seasoning but we did a good job recovering and ended up with an acceptable balance with just a touch too much sweetness from the hot sauce. The sliced beef didn’t offer a ton but it was nice to have it there for a bit of meatiness. 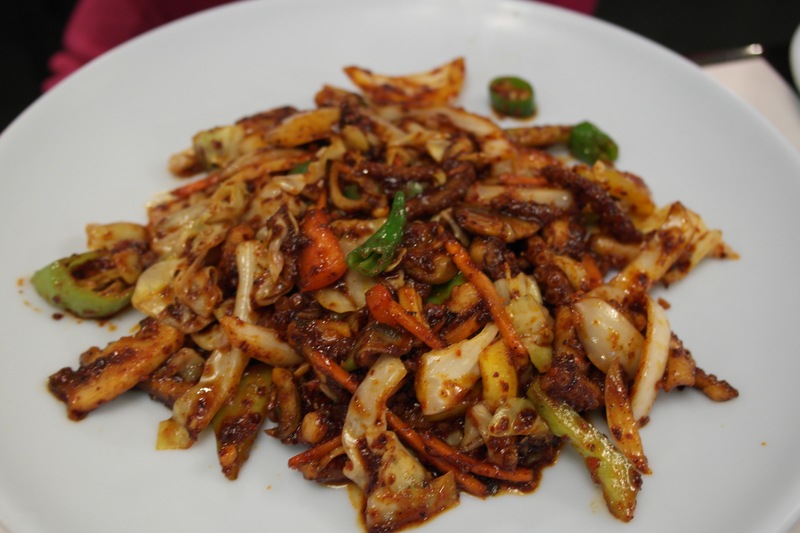 Nakji bokum was our second entree which is pan fried octopus along with onions, carrots and a couple different hot peppers and a chili oil sauce. Eating the dish left a constant burning all over our mouths but at least for me in an addictive way. The octopus pieces were on the small side and the sauce was overly sweet for my tastes almost bordering on General Tsos level. That isn’t to say that I didn’t enjoy the dish but I think with some more balance it could be a real standout. We will probably be back to try some more items on the menu but we weren’t blown away by what we had. Although left with a good amount of leftovers and a reasonable check, I’m not sure Young’s will become a regular stop for us when Sodam is so close by.